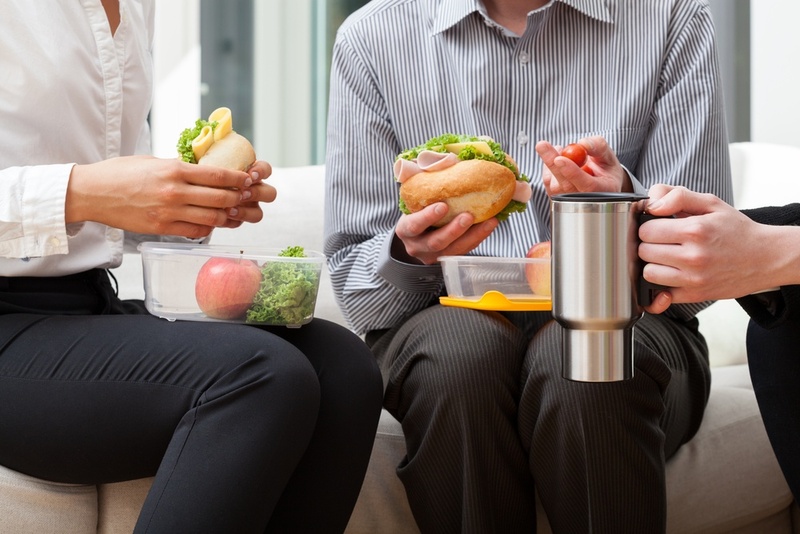 The office lunch break used to consist of two main options – leaving the office to grab some fast food across the street, or brown bag it with a packed lunch from home. Neither choice was usually satisfying, or all that healthy. However, in today’s workplace, corporate dining is just as important of a job benefit as vacation days or a free phone. In fact, many companies both large and small are making corporate foodservice a necessary component for every employee’s work day. As FCSI puts it, workplace dining has become “an integral component of creating company culture.” Business and industry dining brings with it a number of benefits to both employees and employers alike. Here are just a few ways that offering a foodservice option in the workplace can impact an entire company. Whether it’s in grade school or at a Fortune 500 company, bringing the same lunch every day can cause someone to fall in a trap of unhealthy eating habits. Sure, the same ham and cheese sandwich is simple and inexpensive, but is it providing an employee with enough nutrition? Fresh ingredients and locally-sourced menu items, along with multicultural options, will keep the workforce happy and healthy. Healthy eating leads to higher productivity at work. When employees are eating fewer sugars and empty calories, they’ll have more energy to power through the afternoon. The presence of a corporate cafeteria reduces the chances that a worker will leave campus to go get something to eat. When given the chance to dine in a social setting with coworkers, employees are more likely to work better together in the office setting, and a stronger company culture is built. Additionally, having a corporate cafeteria encourages employees to take a break away from their desk rather than taking a working lunch. Research shows that taking breaks increases focus and productivity. By offering a workplace dining option, with a variety of menu items, it can be the difference between hiring a good employee and a great one. Job candidates are always weighing the pros and cons of any company they apply to, and showcasing a corporate dining facility shows a company is putting employees first. Corporate foodservice starts with the foodservice space. Make your space as multifunctional as possible to increase the number of food options and easily change menu items for all meals of the day. That means utilizing equipment that can function for breakfast, lunch, and even dinner. Second, invest in energy efficient equipment. The savings in the long-run from employing efficient cooking, refrigeration, and other foodservice equipment far outweighs any initial costs. One example, Toyota's Headquarters in Texas, which achieved LEED Platinum from the U.S. Green Building Council, features a corporate cafeteria using energy efficient refrigeration equipment from RDT. Refrigeration, along with other essential pieces of foodservice equipment, can make a corporate cafeteria one of the most valuable components in the workplace. Learn more about the refrigeration solutions ideal for corporate foodservice and workplace dining. Sign up for a free one-on-one webinar with one of RDT’s refrigeration experts.